This article is about the 1988 video game developed by Realtime Games. For the 2012 video game developed by Bohemia Interactive, see Carrier Command: Gaea Mission. Carrier Command is a 1988 computer game available on Amiga, Atari ST, PC, ZX Spectrum, Macintosh, Commodore 64 and Amstrad CPC computers. 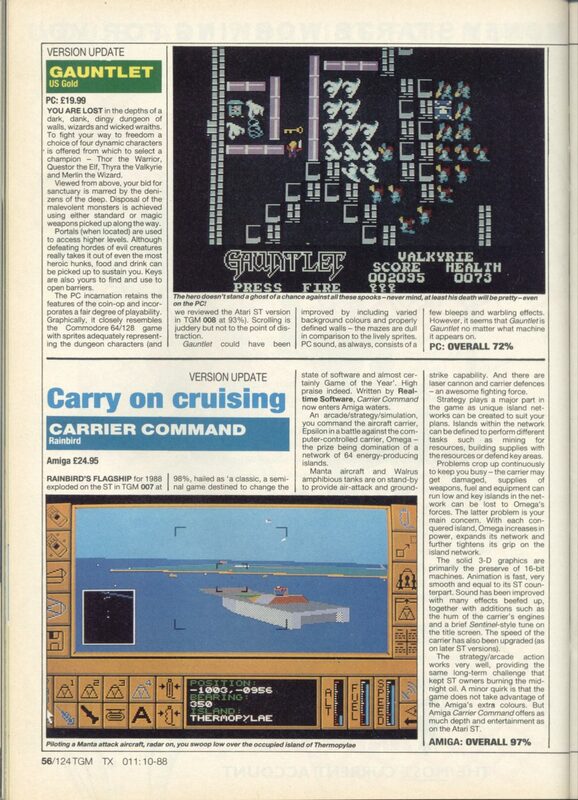 Described by The Games Machine as a "seminal game destined to change the state of gaming", Carrier Command won accolades from across the industry. Carrier Command is a cross between a vehicle simulation game and a real-time strategy game where players control a robotic aircraft carrier. The carrier is not based on any real-life aircraft carrier but was designed specifically for the game. Across all but one format, Carrier Command uses filled-in vector graphics to create a three-dimensional view of the game world. The game does not use texture mapping but uses a simple raster pattern to shade objects. The carrier and the vehicles it carries have full 360-degree freedom of rotation. The Commodore 64 version is the exception and reproduces the same gameplay from a top down 2D viewpoint. When previewed and finally released on Amiga and Atari ST formats, the game received substantial attention due to the level of 3D fluidity in the graphics engine that hadn't really been seen before. The game also featured a sampled theme song by Dave Lowe, which was expanded into a full, studio-recorded vocal production entitled "Just Another Mission". This was included on a tape cassette with certain releases of the game. A similar scheme was used for the later game Starglider 2. A game of Carrier Command can be initiated in two ways. In "Strategy" mode, the player starts with one island and the enemy starts with eight islands, while the rest are free. The two carriers each start at their respective home island, and the two home islands are chosen to be as distant as possible from one another. The enemy carrier, because of its superior speed, can assimilate islands more quickly than the player can. In "Action" mode, the game begins with each player already possessing a network of islands (some islands remain neutral). The enemy carrier has a greater number of islands under its control. The player's carrier begins the game near the center of the map, where there is a much greater chance of confronting the enemy carrier. The player's carrier (ACC Epsilon) is a very complex system, having its own weaponry and automatic repair systems. The carrier has a laser gun turret which is able to fire an unlimited number of shots, but heats up in use requiring it to be rested after firing several shots in rapid succession. The carrier can fire missiles by launching a recon drone high into the sky and then selecting targets while looking through the recon drone. The carrier is also equipped with a decoy flare launcher which works as an aerial countermeasure, and defense buoys to protect it from missile attacks. Damage to the carrier is repaired by the automatic repair system. The carrier is divided up into several systems. With the exception of the carrier superstructure and the automatic repair system itself it is possible to fully repair any of the carrier's systems from 100% damage. The carrier is destroyed when damage to the superstructure reaches 100%, resulting in the loss of the game. Damage to the components is done according to where the impacts are on the carrier. For example, a hit from a missile to the rear side of the carrier will do heavy damage to both the engine and docking bay, but will do little or no damage to the other components of the ship. The player can set the repair priorities for each part of the carrier that will determine which parts will be repaired first. Any component except the automatic repair system that has over 50% damage will not work. Some components that are damaged will operate less efficiently. If the engine is damaged for example, the carrier will not be able to move as fast. If damaged, the laser turret will heat up faster and cool down slower so it will not be able to fire as frequently. The repair system repairs the carrier slower if it is damaged. The carrier carries up to eight Manta (Multirole Aircraft for Nautical Tactical Assault) remote-controlled aircraft and up to eight Walrus (Water And Land Roving Utility Shuttle) remote-controlled amphibious vehicles, although only four of each may be operational at any one time. The remote control of the Mantas and the Walruses has to be linked through the carrier, so if they go too far from the carrier the cockpit screen of them will become ghosted. If they venture even further away from the carrier, they will lose all contact with the carrier and be destroyed; the Mantas will just simply fall out of the sky. A Manta may be equipped with a long-range communications pod, allowing operation of it and any other nearby vehicles as far away from the carrier as desired. However, only one Manta may be fitted with a communications pod at any one time. The Mantas are primarily for combat use, but the Walruses are primarily used to carry payloads to the islands. Depending on the current status of the island, and its intended use, the payload might be the starting kit for a colony, or a virus bomb to convert an enemy colony to the player's side. The Mantas can be equipped with missiles that can automatically lock on to enemy targets. The Walrus vehicles can be loaded with missiles that can be manually guided into targets. Part of the appeal of the game lies in the control of these auxiliary vehicles. The player can, if desired, have all four Mantas and all four Walruses out of the carrier at once, and can pilot each personally, or program each to travel to a specific location (none of the vehicles can be programmed to perform attack or defence functions). Once arrived, a Walrus will simply wait. A Manta will adopt a circular holding pattern until it runs out of fuel, at which point it will crash into the ground or sea and be lost. Some islands have runways on which Mantas may be landed and refuelled. A Walrus which has run out of fuel may be refuelled by another Walrus carrying a spare fuel pod. The carrier can also be piloted directly, or programmed to travel to a specific location, which may be another island. The enemy carrier (the ACC Omega) is also constantly sailing the archipelago, but instead of Mantas and Walruses it uses a stronger variant of the island defence fighter to capture friendly islands, and actually floats onto neutral islands to capture them. If the player manages to destroy the enemy carrier, the game is considered to be won. However, the player is then offered the opportunity to recapture all of the remaining enemy islands in the absence of the enemy carrier. The enemy carrier is of a different design and colour to the player's carrier. It has superior top speed, manoeuvrability, and acceleration, which makes a direct carrier-to-carrier confrontation very unusual. However, it is very vulnerable to direct assault, it lacks the weaponry of ACC Epsilon and can be easily destroyed by a few shots from the turret laser. Alternatively, a Manta has sufficient top speed to catch the enemy carrier when it is still near to an island (in the open sea, the enemy carrier can outrun even a Manta). Two Mantas equipped with missiles have the firepower to destroy the enemy carrier (the first Manta can disable the Omega's engines, allowing the second Manta to destroy it). Another approach is to ambush the enemy carrier while it's busy attacking an island, using a Walrus armed with an Avatar chemical laser. It takes roughly a dozen rounds to finish it off. The enemy carrier's superior speed means that, in the "strategy" mode (see above), it can assimilate neutral islands much more quickly than the player. This means that the player's strategy is more important than the head-on approach. All islands in the game are flat and rectangular, and surrounded by sloping beaches. Neutral islands are covered in trees. Some islands have active volcanoes which erupt glowing rocks. These falling rocks can not damage a Walrus. To assimilate a neutral island, an ACCB (automatic command-centre builder) pod must be placed by a Walrus. The player must nominate whether the island will be a resource island, a factory island, or a defence island. Resource islands mine basic raw materials from the ground, which are used to build defenses and production buildings on other islands. Factory islands automatically produce supplies for the carrier, including fuel and replacement equipment and vehicles. Both are lightly defended. Defence islands are strongly defended and difficult for the enemy carrier to capture, but produce nothing of value. Finally, the larger the island the more effective its role is. The player must ensure there is a good balance of islands, otherwise the carrier will run out of fuel and supplies during the game. The ACCB builds itself into a command centre, and continues to automatically produce buildings and robots to work on or defend the island. Damaged and destroyed units are rebuilt over time the same way. The islands are interconnected with a supply network. Each side can designate a stockpile island where supplies such as fuel and equipment are stored. When this network is disrupted in such a way that the stockpile island is cut off from your headquarters (the very first island you have), resupply becomes impossible. Player has to define stock levels and production priorities for fuel types, ammunition, spare vehicles, missiles, decoys and basically all items available. Enemy islands follow the same nomenclature as player islands, resource, factory or defence. To capture an enemy island, a Walrus may fire a virus pod at the opening on the front of the command centre, which instantly converts it to a friendly island (and leaves all the buildings intact). The enemy carrier has no such possibility. The other way of gaining control of an island, and the only one available to the enemy carrier, is to destroy the command center and build another. This also allows a change of the island type, e.g. from factory to defence. Much of the materials used in previous island type is lost in the process, however. The player has no choice but to destroy command centers of his own islands if he wishes to change their type. Enemy islands may be defended by automated flying units and missile launchers which can easily destroy a Walrus or Manta and even the carrier. As expected, defence islands are the most dangerous. Capturing an island usually require a combination of Manta and carrier action to lessen enemy defenses while one or more Walruses are sent to take care of the command center. The carrier is the most efficient way of clearing a beach using Hammerhead sea to surface missiles. Player must be quick as destroyed structures are rebuilt over time. Walrus can be equipped with 40-shots chemical lasers, a pack of up to 9 wired missiles (driven with a picture-in-picture interface) or a single virus bomb, but not both, forcing the player into launching a coordinated fleet action to succeed. Carrier Command was followed by Battle Command, where the player controls a tank. Hostile Waters: Antaeus Rising (2001) was inspired by Carrier Command and features many similarities. Carrier Command: Gaea Mission (2012) is a modern remake by Bohemia Interactive's Prague studio. It's a real-time action/strategy game, where the overarching objective is to conquer and control islands. It features a vast 33-island archipelago on the planet-moon Taurus. The Games Machine awarded the Atari ST and Amiga versions 98% and 97% respectively and ranked Carrier Command the #1 game of 1988. ACE (Advanced Computer Entertainment) scored the PC version 965/1000, while Zzap!64 magazine awarded the Amiga release 92%. The game was ranked the 15th best game of all time by Amiga Power. Computer Gaming World in 1988 praised the game's blend of strategic and tactical play, recommending it as an improvement over Starglider. 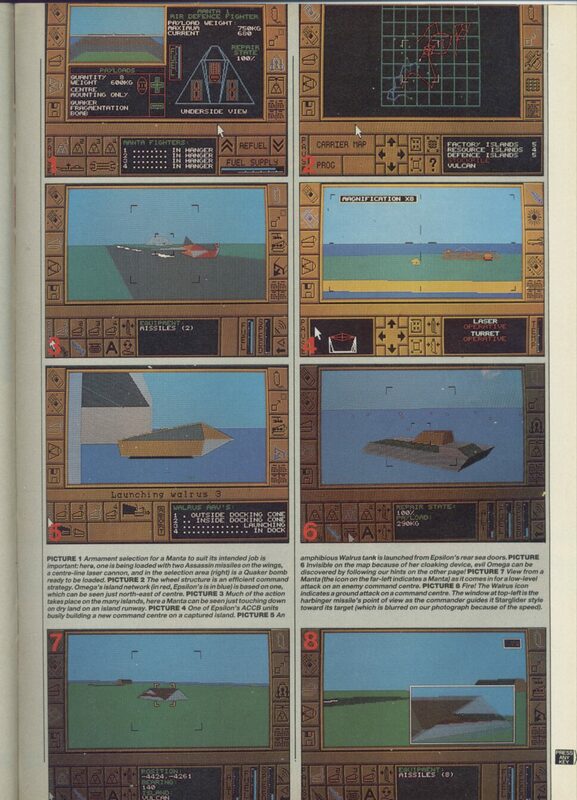 A 1992 survey in the magazine of wargames with modern settings gave the game two and a half stars out of five, describing it as a "futuristic arcade game", and two 1994 surveys gave it two stars. The ZX Spectrum version was awarded a "Crash Smash" with 97%, and was awarded 94% by Your Sinclair, and was placed at number 12 in the Your Sinclair official top 100. 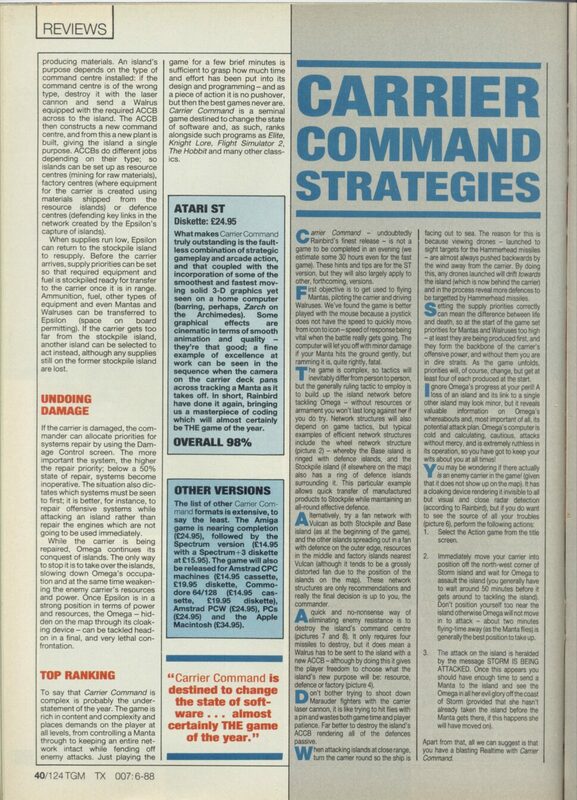 In 1991, PC Format named Carrier Command one of the 50 best computer games ever. The editors called it "a splendid mixture of strategic planning and arcade action". 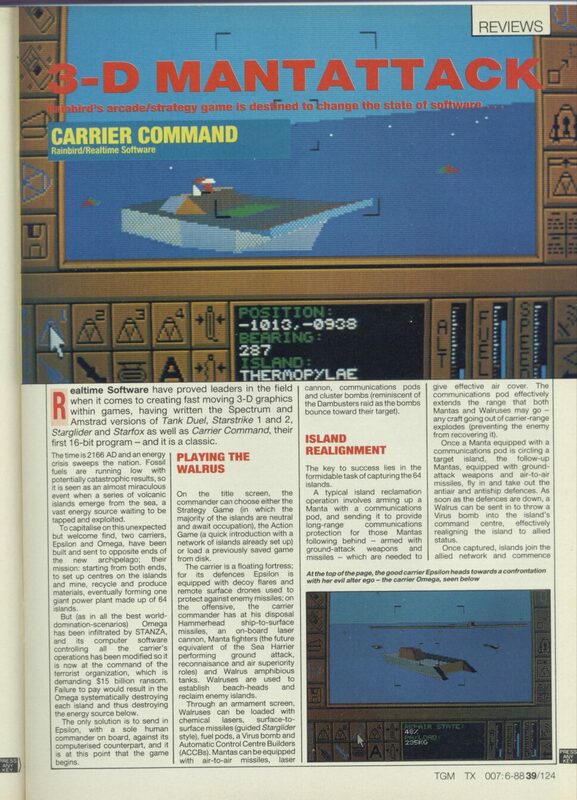 Carrier Command was named the 56th best computer game ever by PC Gamer UK in 1997. The editors wrote that it "packs more flight-sim, sea-sim and tank-sim action and strategy than a dozen of your so-called CD-ROM games could manage in a million or more megabytes." ^ a b "Carrier Command". Archived from the original on 2007-03-12. Retrieved 2007-01-06. ^ a b Brooks, M. Evan (June 1992). "The Modern Games: 1950 - 2000". Computer Gaming World. p. 120. Retrieved 24 November 2013. ^ Battles, Hosea (October 1988). "Terrorism in the 22nd Century". Computer Gaming World. pp. 22–23. ^ Flynn, James; Owen, Steve; Pierce, Matthew; Davis, Jonathan; Longhurst, Richard (July 1997). "The PC Gamer Top 100". PC Gamer UK (45): 51–83.